"Everything happens for a reason" a favorite quote of mine from the movie "Life As A House". Many things have happened in my life these past few weeks and some have me wondering what the reason could possibly be, I sure don't know. I suppose all will be revealed in time and I will be patient. I will plan ahead and do my best, comfort those in need and rely on my support system of family and friends. In the mean time I've been working on a couple of projects and organizing the decorations for the outside of our home. This year I'm getting the whole crew here onboard and make some fun, take some many pictures and bake some cookies for all the little Elves! In my studio I continue to work on my customer's quilts and get them done for Christmas, I also need to get some of my projects done for Christmas as well! Wish me luck! The two pics below are just 2 that need finishing. 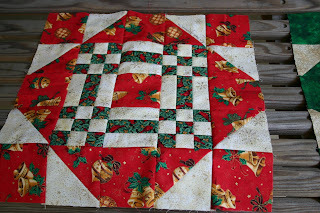 The ornament quilts needs it's borders and the Christmas block was from an exchange that I did on the APQS forum last year, those I'm still trying to decide on how to set them! There is the snowman laps from fats pattern that needs borders and some others that I can't think of. 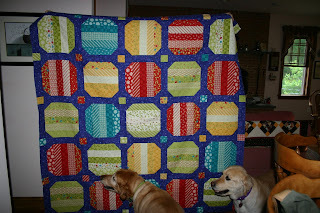 I need to buckle down and get sewing and quilting! Ta ta for now!